By the way, there’s really no reason to think Joseph Smith didn’t actually have these in his possession. The misguided indignations of Jeremy Runnells notwithstanding, the answer is simple, really, as explained by Michael McKay and Gerrit Dirkmaat. So, what was the purpose of having the plates if Joseph left them covered during the translation? Though Emma [and other witnesses] explained that Joseph did not use the plates, as a traditional translator would have, they were still deeply important to the translation. They represented where the words originated–––demonstrating their historicity, and forming a sense of reality about the individuals described in the Book of Mormon. The plates were in essence the body for the spiritual words that fell from Joseph Smith’s lips as he translated. They created confidence in the minds of Joseph and his family and friends. They offered believers something physical and tangible to understand how and where the text of the Book of Mormon originated. They were also invaluable for demonstrating that Joseph Smith was a chosen seer. 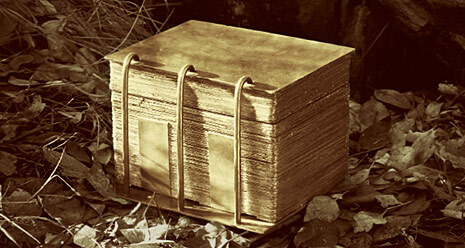 The relationship between the plates, Joseph, and God was indelible for communicating the nature and purpose of the Book of Mormon. Without the plates, the translation was empty, and without Joseph’s gift, it was not from God. So remind me again what the problem is, because I just don’t see one. I think the necessity of the plates is demonstrated by the fact that both believers and critics keep talking about them. From a believer's perspective, it's as if God introduces through the Book of Mormon a calculated interruption/agitation into people's lives; while modern readers don't get the kind of hands-on experience of the gold plates, as these initial witnesses did, the story still sits in a way in the minds of others so as to make them "itch," to discomfort them, and thus call them to struggle with this book–to let the reality of its existence sink in. In hopes, I'm guessing, that it's message might be genuinely engaged in the process. By the way, is this quote from the new response to the CES letter? The quote from Runnells comes from the CES Letter. The quote from McKay and Dirkmaat I found on my own. I don't think it's in the new response, although I suppose it should be. Nathan Smith, I'm going to borrow that Martin Buber quote! Besides this, there is another thought that comes to mind. We are partakers in our own salvation, right? The plates are necessary because the enormous amount of work Mormon, Moroni and the other prophets put into compiling the history of their people was part of _their_ salvation. Moroni did not "lug the plates 5,000 miles from Mesoamerica" to New York. That point alone proves the heartland theory. Central U.S. is the promised land, has always been the promised land, and always will be the promised land. "Moroni did not "lug the plates 5,000 miles from Mesoamerica" to New York." Unless, of course, he did. Moroni didn't have to lug the plates 5000 miles. There has been proof that areas of the BOM happened around the great lakes area. There is a Native American tribe that has had their DNA sequenced, and there is a genetic marker in their DNA that only appears one other place. Jerusalem. That tribe has been identified as the tribe of Joseph. Not by adoption, but from their DNA. Also there in that region of Pennsylvania and that area, there are great hills of bones. Areas that match the definitions of fortified cities. All of this is the area around the Hill Cumorah. "The title page of the Book of Mormon is a literal translation, taken from the very last leaf, on the left hand side of the collection or book of plates, which contained the record which has been translated." For the title page, at least, Joseph used the plates during his translation. He specifically says so. So can we please stop saying that he didn't? Yes, some of the witnesses say that Joseph translated with his face in a hat, but I doubt very much that any of the witnesses say he *didn't* use the plates. That's a leap we're making, one that I don't believe is justified by the evidence. *How* Joseph used the plates is another question, one that needs further investigation. “I wrote, with my own pen, the entire Book of Mormon (save a few pages), as it fell from the lips of the Prophet Joseph Smith, as he translated it by the gift and power of God, by the means of the Urim and Thummim, or, as it is called by that book, 'holy interpreters.' I beheld with my eyes and handled with my hands the gold plates from which it was translated." (“Reuben Miller, Recorder of Oliver Cowdery’s Reaffirmations,” BYU Studies, 1968). *How* it was translated from the plates is another question, but Oliver was in a position to know that it was. The plates were needed to be mentioned as existing because it was part of the scam. You sure are a funny guy Mr. or Ms. Anonymous. Too bad you're generic post added nothing intelligent to the discussion. But the plates were more than just "mentioned." They were physically present in the lives of many people between the years 1827–1829. And yet, the friends and family and "believers" never got to see them. In fact, they were warned that if they saw them, they'd die on the spot. I'm afraid you're deeply confused. Please carefully consult the work of Richard L. Anderson, Steven C. Harper, Michael McKay, and Gerrit Dirkmaat on this topic. Several witnesses not only interacted with the plates and other objects on a physical level, many also saw them directly (see 11 Witnesses statement). Interestingly, we see the same thing with , the Book of Abraham. Joseph needed some proximate connection for the revelation – some way to physically tie back to the original words. For the Book of Moses and the rest of the JST, that was the Bible. For Abraham, it was the papyrus scrolls. As for why Joseph needed something related physically related to the record – is that to direct the revelatory stream? Or to do what he could for that? I don't know but in all those cases, it certainly seemed vital. I joined the Church 5 years ago. After a couple years I let things bother me, and almost fell away. No more. I know it is true and don't care anymore about whys and ifs. I know Joseph is a prophet and so is President Monson and I will listen to them. @ Bruce Horn: thanks for sharing and stay strong. Things are going to get tougher for faithful members. We can see that we are in the beginning of the last days. When evil is called good, and good is called evil. It is happening. The wheat is being separated from the tares. For a very long time I doubted there was a God…a higher Being who had powers. Where did the power come from? Where did it all start? Joseph Smith's vision was what helped me turn around. A regular person close to the "modern" age (as opposed to Bible times) said he saw God, Jesus, and Angels. So I studied, and there is no way JS could have known some things unless it came from a Higher source. JS's vision converted me. The critics accuse JS of being in the occult and magic (in a bad way). But if the critics would take an honest look at the Bible it is full of the occult and magic, as they use these words. Atheists use this argument against Christians, and I have not seen a Christian put forth a good argument to counter the Atheist claim of magic and occult. What is thrown at the church can also be thrown at mainstream Christianity, and other religions.